Bee Safe and Lock offers lock re-keying service for your home or business. Once we have re-keyed your locks the old key will not work in the lock. New keys will be provided and those with keys that previously worked the lock will no longer work. Re-keying your locks is cheaper then replacing your locks. Many people are not aware that they are able to re-key their locks and are often taken advantage of by locksmiths who replace locks when it is not needed. What is re-keying? 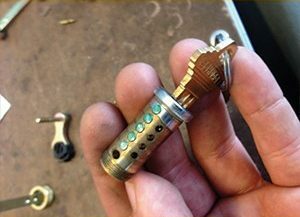 Rekeying a lock is changing the pins inside the cylinder so that the old key will not work. Why rekey a lock? You have lost your keys, moved to a new house or acquired a new business. You should also re-key your locks if you have employees that have left your company that had key access to your premises. In most cases we are able to key your locks alike if you have doors that are not on the same key. We can re-key the locks alike or provide you with solutions to be able to do so in most cases. Your locks will be re-keyed by a Bonded and Insured Locksmith company. Not all Locksmiths can be trusted and you need to do your due diligence in knowing who is changing your locks.